Most of us have never even tried to imagine a life without plastic bags, but the ubiquity of these disposable conveniences has wreaked havoc on the environment. Though the government issued restrictions on carrier bags in 2008, lax enforcement has led to this drive barely being carried out. A street food vendor surnamed Wang in Beijing's downtown Dongcheng district, gives away hundreds of free plastic bags to his customers every day. "These plastic bags are quite cheap so I don't mind offering them to customers for free," Wang said of the flimsy bags which are rarely re-used. 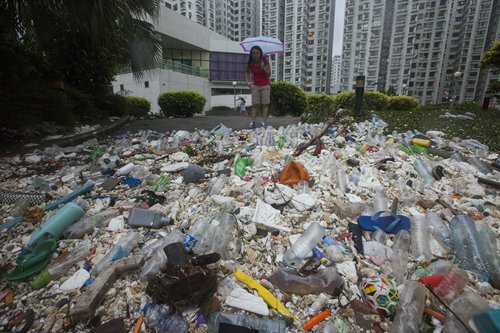 Mao Da, the founder of the China Zero Waste Alliance, a platform that promotes alternatives to landfills and incineration, told the Global Times on Tuesday that only well-known supermarkets in big cities are now following the government's order, while most small businesses still offer people free plastic bags. All plastic shopping bags that are thinner than 0.025 millimeters, which are also referred to as "super-thin" plastic bags, are forbidden to be produced, sold or used in China and customers should pay for plastic bags at all shops, stores, markets and supermarkets, starting from June 1 2008, according to the website of the State Council. The order was obeyed at first, with many shoppers bringing their own bags instead of paying for them, the Xinhua News Agency reported in July, citing Zhang Hongyan, a supermarket employee in Beijing. However, the initial success proved to have a lifespan similar to that of a super-thin plastic bag. Local governments and all departments are responsible for enforcing the ban, according to the website of the State Council. However, Ma explained that the subsequent lax enforcement of the ban was a consequence of the fact that "no relevant government department is directly responsible for implementing and supervising the order." "It reflects that there is a lack of a supervision mechanism over the implementation of the order and no relevant department gives updates on how the order is being enforced these days, which is a situation that has existed for the whole 9 years since the order was first announced," said Ma. "Another cause of the current situation is that no specific reduction targets were mentioned in the order, which lead to lax implementation," said Ma. "Although China was a pioneer in imposing a ban on plastic bags, the country has been left behind in terms of supervision," added Ma, mentioning that countries such as Ireland and Bangladesh have successfully reduced the use of plastic bags. Ireland has charged consumers to use plastic bags nationwide since 2002 and Bangladesh completely banned the use of plastic bags in the same year, shutting down all plastic bag manufacturers since then. According to a survey conducted by the China Youth Daily in May, 86.4 percent of the 2,007 people interviewed were in favor of further restrictions on plastic bags. More than 60 percent of those interviewed blamed insufficient government enforcement for the ineffectiveness of the State Council's order. Increasing incomes have also allowed people to afford the extra cost of having to pay for plastic bags, the Xinhua News Agency reported in July, citing Liu Junhai, a law professor at Renmin University of China. "A few cents is not significant for some young consumers, so they would rather purchase plastic bags due to the convenience," Zhang added, according to the Xinhua report. A total of 71.6 percent of those interviewed said consumers are not environmentally aware, and nearly 40 percent said environmental education should be strengthened. While the plastic bag ban exists in name alone, a new plastic problem has emerged with the rapid development of food take-away online platforms, the Beijing News reported on Sunday. It is estimated that there were 256 million users of online take-away platforms in 2016 and this group would use 256 million plastic bags and plastic food containers per day if they each ordered something to eat once every day, the China Youth Daily reported on Tuesday, adding that each plastic container or bag takes hundreds of years to degrade. Some leading online take-away platforms are carrying out measures to protect against plastic pollution. Food delivery app ele.me told the Global Times on Tuesday that it has promoted a project in which users and restaurants can pay for more eco-friendly containers since 2011 and it also swapped its old plastic bags for bio-degradable ones in April, with the first batch being sent to Shanghai and such environmental-friendly bags now being promoted all over the country.